During our summer trip to Ghana, the Touch A Life staff asked the kids at our Care Center what they wanted most for Christmas. The boys decided on shin guards and the girls asked for Christmas dresses, but our team noticed that the children only had school shoes or Crocs to wear, so we added some quality sneakers to the wish list for each child. When a team returned in November, the children were told they could open an early present – the sneakers and a new set of Crocs donated by the Allen, TX Find Your Mark Chapter! 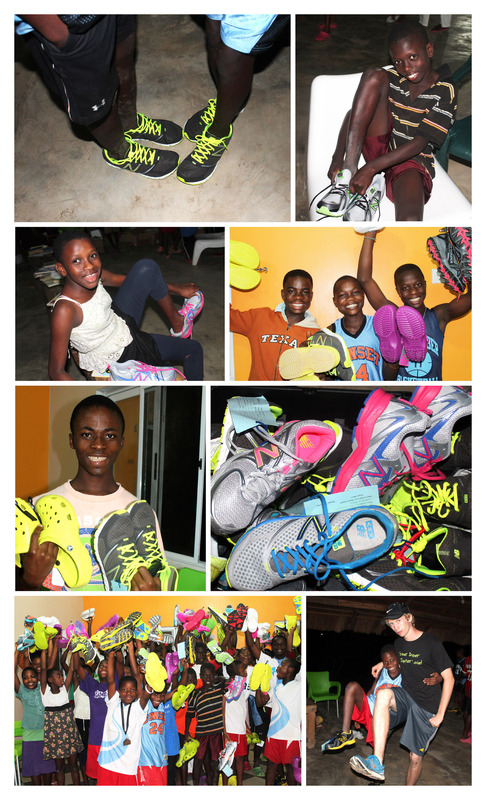 Each child tried on sneakers and found a pair that fit just right, and then everyone celebrated! Now our boys and girls have a pair of shoes that will protect their feet as they explore the Care Center campus and play all kinds of sports. We cannot thank you enough for the generous support that made this big surprise possible! Merry Christmas! I would like to make a donation to your organization by tomorrow so you can take advantage of the matching program. I would like your address so I can mail a check. Thanks for all you do!